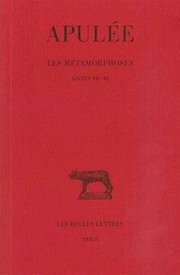 1 edition of Apulee, Les Metamorphoses: Livres VII-XI: 3 (Collection Des ... found in the catalog. Add another edition? Are you sure you want to remove Apulee, Les Metamorphoses: Livres VII-XI: 3 (Collection Des Universites De France) (French and Latin Edition) from your list? Published Jul 15, 2002 by Les Belles Lettres . February 20, 2019 Created by Clean Up Bot Inital record created, from an amazon.com record.